The New 52 reboot set the Justice League against the forces of Apokolips, which culminated in "The Darkseid War," a story that left many unanswered questions, as Rebirth set the DC Universe on a different course. Hitch's work greatly resembles Johns' inasmuch that his stories are, again, dealing ominous outside forces, bent on doing something ill to the Earth and the DC Universe proper. The Kindred, the Timeless, the Reavers, even this installment that features a sentry who guards the so named "Darklands," all inform the reader that for every victory that the League gains, they are losing ground against a much larger force. A force that cannot be qualified or quantified, it would seem. It spans time, space, and dimension. 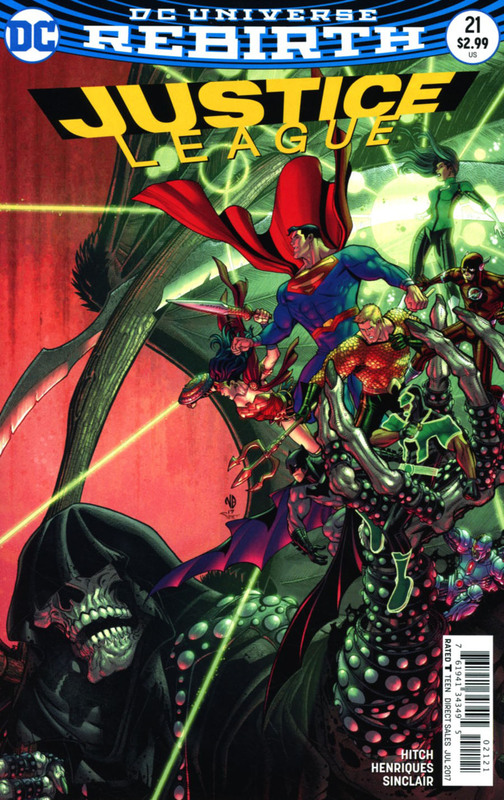 Justice League #11 saw the League take a moment to have a needed forced conversation, but again with the backdrop of some otherworldly force trying to subjugate the world. The main caveat to the steady march being done here, is to have a clear memory of what has come not long before. 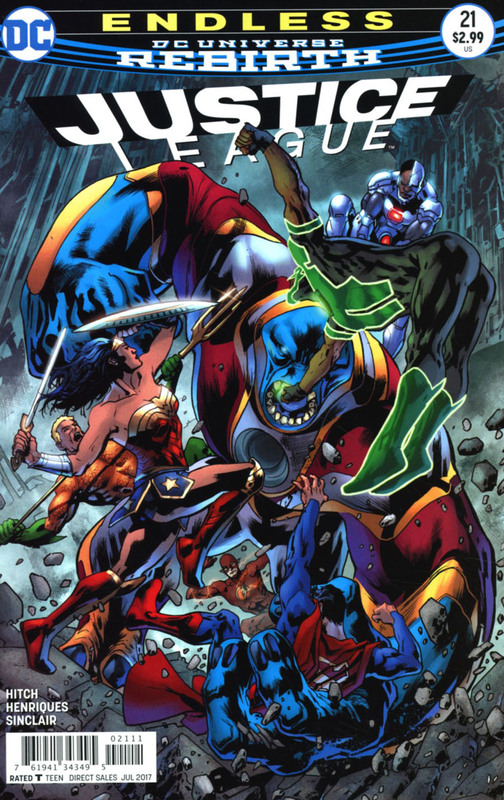 It took fifty issues to get where the Justice League faced off against the Anti-Monitor and Darkseid, but it was, sad to say, all for naught. Readers are being placed on the same course again, hopefully with different results. The Batman and the Flash have been quite the pair of late, doing detective work in their current respective series ("The Button," if you haven't read it), and here in the latest issue of Justice League we're treated to more of the same. While there is some stretching to make The Flash a detective of Batman's caliber in "The Button," the duo are much more fluid here, and, quite frankly, a welcome change by me. The Batman should always be shown as a detective. Master strategist, all around badass, Mary Sue is how he's displayed by the laziest of writers, but as a detective? That requires work, and Hitch does a nice job of it by showing how easy Batman places the pieces together, where you can only wonder how that conclusion wasn't the foremost in your mind from the start. Art - 3: The art still seems to just lack the polish of Hitch's earlier work. The last panel that shows Batman is quite rough, but I suppose it works for such a rough and tumble character. Cover Art - 3: What is going on with Wonder Woman? She looks like a Renaissance painting of a woman... when men didn't know how to draw a woman's body.